Since the first edition of this book was published in 2001, Maple™ has evolved from Maple V into Maple 13. Accordingly, this new edition has been thoroughly updated and expanded to include more applications, examples, and exercises, all with solutions; two new chapters on neural networks and simulation have also been added. There are also new sections on perturbation methods, normal forms, Gröbner bases, and chaos synchronization. 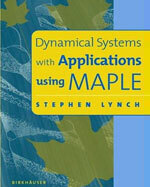 The work provides an introduction to the theory of dynamical systems with the aid of Maple. The author has emphasized breadth of coverage rather than fine detail, and theorems with proof are kept to a minimum. Some of the topics treated are scarcely covered elsewhere. Common themes such as bifurcation, bistability, chaos, instability, multistability, and periodicity run through several chapters. The book has a hands-on approach, using Maple as a pedagogical tool throughout. Maple worksheet files are listed at the end of each chapter, and along with commands, programs, and output may be viewed in color at the author’s website. Additional applications and further links of interest may be found at Maplesoft’s Application Center. Dynamical Systems with Applications using Maple is aimed at senior undergraduates, graduate students, and working scientists in various branches of applied mathematics, the natural sciences, and engineering.